How to reach Venice's airport, railroad station, hotels, and historic center from the cruise terminals. 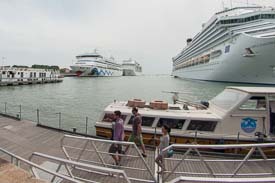 In another Venice for Cruisers article, we describe Transportation to the Port of Venice, a.k.a. getting to your ship. This article is about something different: how to reach Marco Polo Airport or Venice's city center after disembarking from a cruise ship. In addition, the Sette Martiri or "Seven Martyrs" waterfront mooring above the Piazza San Marco is often used by visiting ships and river vessels that aren't beginning or ending cruises in Venice. Our advice: If you're worried about missing your flight, purchase a bus transfer from your cruise line. It won't be cheap, but you'll be able to go directly from your ship's pier to the airport, and the cruise line will be responsible for making sure that you reach the airport on time. On the following pages, you'll find detailed advice on ground transportation from the Stazione Marittima, San Basilio, and Sette Martiri cruise piers. Also see our More Resources page, which will point you to other useful transportation articles at Venice for Visitors.